The dynamics of ever-increasing complexity is the most characteristic feature of modernity. Complexity, in turn, presupposes ambiguity, a multitude of degrees and layers, and the parallelism of dimensions and worlds. Humankind arrived in the twentieth century with the appreciation of the need to recognise the sustainability of not one but several ‘pictures of the world’. In modern art, complexity is manifested in everything, but primarily in formal approaches and the technological know-how that change not only visual forms but also the very conditions of the perception of the works of art and their presentation in public places. I would perhaps not err from the truth too much if I said that the inventions of modern art that are specifically tied to the changes in the conditions of perception and the ‘games’ in space have been the most resounding ones. For instance, let us take 3-D cinema, which is so popular nowadays; or holographic photography that is perhaps not so common but still belongs to the same impressive visual forms. It is as though they attempt to make the viewer clash with very physical nature of reality while at the same time eliminating the conventional nature of the works of art. But this dimensional-spatial format does not go beyond the limits of the purely fairground-like attraction and the somewhat superficial illusion that hovers on the verge of being a circus trick. It is highly commercialised and aimed at attracting massive audiences. The photo collages of the beginning of the last century look much more interesting in terms of innovation and creativity. And, in general, the collage (montage) as a technique widely used in the Early Avant-Garde period has regressed into the unimaginable popularity ofthe Photoshopera. The multi-expositional digital collage technique helps to uncover the multi-dimensional nature of reality by showing its diverse aspects without using complex technological contraptions of any kind. Fakhriyya Mammadova’s project Dua*s needs to be considered in the context of this research or the research that is contextually akin to it. The photo objects by Fakhriyya are capable of inflicting cognitive dissonance on the viewer because what they see in front of them is unclear: is it a photograph or a minimalistic sculpture? 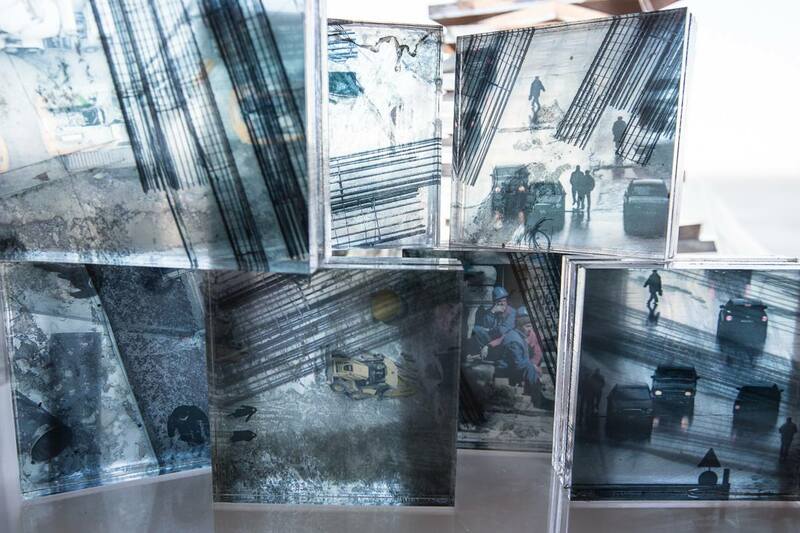 Let us look at them – and they are all identical in form – and contemplate the cuboids consisting of two attached square pieces of organic glass between which are two different shots (hence the name of the project) printed using a special digital method that creates transparency. In this way, as we look at the photographic object from the front, we can see two photographs layered one over another – it is as though we are getting a double imagethrough this method. The combination of the spatial volume and planar image is far from new: sculptures are painted over more often than not and, furthermore, in ceramics we often come across pained three-dimensional sculptural form – this is the specific feature of ceramics as a branch of decorative art. But the combination of the volumetric structure and photographs is not so frequent a practice in creative work. And since we are talking about the use of more than one photograph, and given the presentation that Mammadova is putting on, we can now talk about a far-from-trivial vision of the combination. A photograph and a spatial object…, or, if we take the Heidegger-esque inclination towards linguistic combinations as sources of inspiration, we can say ‘a-photograph-as-an-object’.Incidentally, these works of art can also be taken as designer artefacts with a touch of the souvenir quality to them. In this sense, the photo objects can have a purely pragmatic importance in that they can be used as interior décor elements or something along those lines. To my mind, though, their artistic value lies in the specific approach used as well as in the technique of making a photograph spatial and of creating the double image – with the reservation being that the photographs do not mix on a two-dimensional plane but are situated in parallel spaces and at a very small distance of clearance from each other. What does happen in the end, then? And why is it that we cannot talk of the traditional regime of the double-image in this case? The reason is the essence contained here in the spatial clearance between the photographs that creates an outlet from the two-dimensional space – the path that leads to three-dimensionality. Let us say that when we observe an ordinary double-image shot printed on film paper, we understand that we cannot – indeed will not be able to – artificially separate the two images combined on the plane. The two-dimensional surface of the sheet forever fixes the two photographs together - they belong to the same space. They are just two in one. But the multi-dimensionality is only realised here in the symbolic sense and nothing more. The plane stays just so – as the plane. What Fakhriyya does is to fracture the two-dimensionality while preserving the photographic worlds within their own visual dimensions. That is to say, they do not intersect and remain independent from each other. Meanwhile, in the case of the two-dimensional multi-image photograph, we would see the same image if we shifted the angle of viewing and nothing would change, while the three-dimensional double-images would be found to alter. For instance, what we see from a viewing point askew and at a high angle would be different from what we would observe if we looked at this object from the front, since the front photograph is not simply combined with the rear one but is specifically placed over it at a distance – it obscures the rear photograph, as it were. And as we change the viewing angle we naturally vary the geometrical correlation between the photographs and the spatial ‘holographic’ effect is thus created. The symbolic interpretation of this technique is equally interesting. Various theories describing our world as an assemblage of many dimensions are popular nowadays, withparticularly many disputes in modern physics and quantum mechanics. Well, those worlds and dimensions coexist: they are parallel and are one inside another like in a series of Russian dolls. But they do not intersect while they coexist; rather, one can see those worlds together…,interlayered but not touching each other and by themselves like independent and autonomous universes, if one achieves the transparency of perception and uses the special ‘spiritual vision’ rather than the ordinary optical one.